Bangkok Hotel Lotus Sukhumvit ? Managed by AccorHotels is a 5 star Sukhumvit Hotel that is ideal for business trips and holidays alike. With 224 comfortable and spacious rooms, and a wide range of facilities, this Sukhumvit hotel is the best One-Stop located hotel. 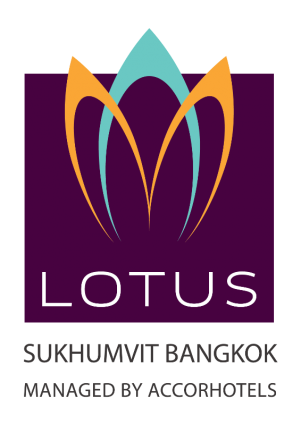 The Bangkok Hotel Lotus Sukhumvit is strategically located in one of Bangkok?s most prime location and district. Located at Sukhumvit Soi 33, it is only a moment?s walk from Phrom Phong BTS station, and is close to the EmDistrict. EmDistrict comprises of 2 upscale luxurious malls, which are Emporium Shopping Centre and EmQuartier and Benjasiri Park. There are also many local street markets and places of entertainment with a vibrant night life surrounding the area as well. Guest can easily travel to popular locations within Bangkok, such as Siam Square, Asoke, MBK, Terminal 21 and Bumrungrad International Hospital with a 10 minute BTS ride from Prom Phong BTS Station. Our flagship restaurant, Coco?s Caf?, presents a scintillating dining experience amidst a stunning new contemporary design. The ambience is so fluid that Coco?s transforms from an all-day Asian dining concept during the day to an iconic international buffet in the evening and a modern poolside lounge. Le Boulanger Bakery Shop is located at the Hotel Lobby and showcases the hotels premium Pastry?s, Cakes, and Chocolates. Le Boulanger is more than just a bakery, as we have evolved it to a Bakery/Lounge/Bar. This concept offers new innovative and exciting products, but still maintaining the same traditions of its most popular cake recipes and hi-tea offers. With three multipurpose meeting facilities that have the flexibility to adapt to your needs, our Sukhumvit hotel is the ideal place for your events. Our Lotus Room has the ability to be converted into 3 separate rooms, or one large ballroom, which can accommodate up to 450 guests. The Lounge@8 , on the 8th Floor is ideal for your private parties or small meetings & conferences. With themed menus and set up, the space is perfect for celebration of events catering between 10-120 guests. Coco?s Caf? and the poolside area can be used as an option for your meeting venue or parties as well!